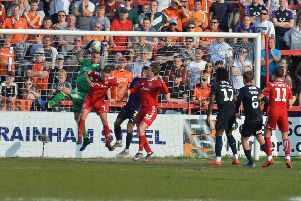 Former Luton striker Craig Mackail-Smith has urged the Hatters follow in the footsteps of his former club Brighton as they look to bounce back from their play-off heartbreak at the first attempt. The Seagulls, who the experienced forward made more than 100 appearances for during a four-year stint on the south coast, came third in the Championship in 2016, but were then beaten by Sheffield Wednesday over two legs. However, Chris Hughton’s side bounced back in style, finishing second this season to reach the Premier League, and Mackail-Smith believes Town should try to emulate that achievement after their last-gasp defeat to Blackpool recently. He said: “I watched both of the games on the TV and was willing them all the way. “It’s a great set-up, a great bunch of lads, the staff are fantastic, it’s a massive, massive club, so it should be in the higher divisions. “I was bitterly disappointed for the goal to go in with basically the last kick of the game, it was just absolutely heartbreaking. “But being so close and then actually understanding what it takes to get out of this division, I think it helps. “Look at Brighton, they’re a great example. As they missed out on the play-offs and then next season they went and got promoted. The 33-year-old is clearly confident that his former team-mates have what it takes to finish at the top of the tree this time, and that they can gain strength from their gutting finish to the season. He continued: “The squad that Nathan has there is very, very talented. “If everyone looks back at the season, maybe it was a little bit disappointing not to get automatic when you look at with around six or seven games to go, they got above Portsmouth and then kind of went in the opposite direction. But it’s football, these things happen and I think the boys will be stronger for it. “Next season they’ll know exactly what they have to do to get in the top three spots and if it was to come to the play-offs, they know exactly what they have to do to get out of it. “It’s all learning curves, they’re all young, all hungry players who want to succeed. Keeping hold of their star attractions will be an ongoing battle for boss Nathan Jones during the close season, but Mackail-Smith felt even if a few are tempted away, then Town can cope. He said: “They’ve done fantastically well, James Justin did unbelievably, he’s had a fantastic season so I’m not surprised that bigger clubs are looking at him. “It would be fantastic to keep hold of him and Cameron (McGeehan) and maybe Danny (Hylton) because they’ve done so well. But I think the the recruitment you’ve seen, they’ve done well bringing players in. With boss Jones confirming he wants to add to his squad too, Mackail-Smith felt a bit more know how to aid the youthful group of players would be a benefit. He added: “I think experience is massive in any team and having young, enthusiastic lads is great, but sometimes they need a bit of direction.